She-Hulk — Bright, quippy, and shedding light on the legal realities of the Marvel Universe, I love this book led by a fascinating character with wonderful human edges and supported by fantastic, atypical art. Sadly, my love was not enough to keep it from getting cancelled. I read some readers bristled at work by series artist Javier Pulido and fill-in artist Ron Wimberly (who deserves a marquee title of his own). That’s a damned shame if it sunk the book. I loved its unusual look, which worked well with the story’s special blend of mundane troubles and extraordinary people. Series writer Charles Soule is now exclusive to Marvel, so here’s hoping he can come back to Jessica Walters soon. Superheroes should be so lucky as to be drawn by Wimberly. Lumberjanes — Originally intended to be an eight-issue miniseries, Boom! Studios quickly switched it to an ongoing with the most recent issue serving as a bridge between longer storylines. I’m glad it’s sticking around as it provides a very unique energy and voice to comics as a whole. Silver Surfer — This fun and poppy wandering through Marvel’s cosmos filled with groovy aliens and genuinely delightful leads is still going strong with no end in sight. Glad to see it continue as I’ve never before cared for Silver Surfer or been able to wrap my brain around the Marvel cosmos. Now, it’s all sweet to visit once a month. The Mercenary Sea — Sadly, the creative team and Image have decided to switch the series from on-going to a series of miniseries in order to manage the workflow. I think it’s for the best as the tremendous artwork by Mathew Reynolds can’t be easy on a monthly schedule. Writer Kel Symons already has another series, a fantasy, out from Image, so at least his voice will be out there with some frequency. Just a shame that we have to wait that much longer to see if Jack finds Ko Jira. But honestly, work like this is worth the wait. Secret Avengers — While this Avengers equivalent of a James Coburn spy-spoof continues to be one of my favorite books , writer Ales Kot always intended his story to come to an end before the title reached its second year. It is unclear what will become of the it afterward, but with a new S.H.I.E.L.D. title featuring Coulson already on the stands, I’m betting good money that the Secret Avengers will disband. As long as M.O.D.O.K. finds some place to thrill me monthly, I’ll be okay with that. Seriously, it’s time for the solo series. Gotham Academy — This consistently interesting and innovative book with superb, seemingly animated art by Karl Kerschl with colors by Geyser and Dave McCaig will presumably go on hiatus in the spring when the Convergence crossover event takes the place of all normal DC titles while the DC offices complete their move to Burbank, CA. I hope it remains the same afterward. The book doesn’t seem too dependent on any particular DC continuity and would fit in no matter what the DC Universe looks like come the summer. 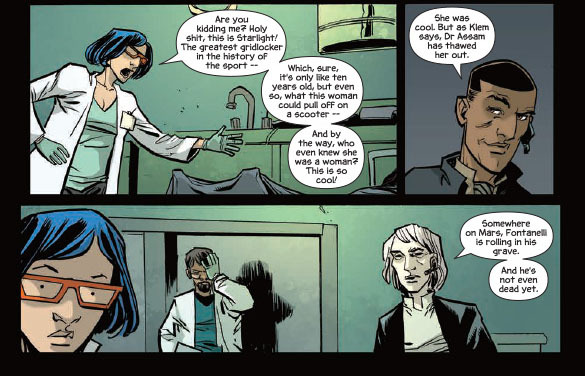 The Fuse — Now into the second issue of its second storyline as Klem and Dietrich become more distinct and likeable. Dietrich fails to land a single joke. Klem is a walking history lesson of the station, having built part of it and eventually becoming a cop. Her son works in the mayor’s office. This may have something to do with the present case, the death of a star in the station illegal EVA racing circuit. Or it might just be drugs. His terrible sense of humor is priceless. Okay, that’s it for now. I do want to give honorable mentions to Batgirl and The Fade Out. I discussed the former last month and I want to give the latter more time to simmer as its world and characters get more fleshed out. Along with the seven listed above, it really made 2014 a year to shout yay for comics! This entry was posted in Four Color, Nerd Alert and tagged gotham academy, Lumberjanes, secret avengers, she-hulk, silver surfer, The Fuse, the mercenary sea. Bookmark the permalink.